The Jetsons episode A Date With Jet Screamer originally aired September 30, 1962 as the second Jetsons episode ever. 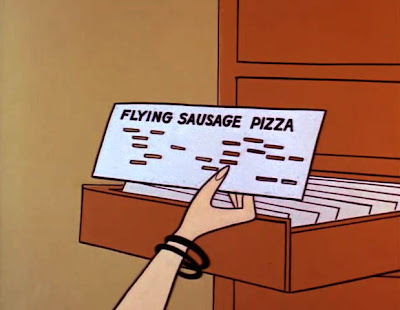 Even with flying cars and robot maids the Jetsons still utilize punch card computers to cook their instant meal. The advancements of push-button technology are obviously evident in most Jetsons episodes but it's funny to think that in 1962 punch card computers were still the technology of the future. Below is a clip from the episode. You can watch the entire episode for free or you can find it on the DVD set The Jetsons - The Complete First Season. UPDATE: Google has apparently never heard of fair use, so they pulled my short video clip of an episode that is available free online. And that means I love you! And that was sung by none other than the late Howard Morris, aka Ernest T. Bass on "The Andy Griffith Show." A great character actor and voiceover artist. Actually, according to http://www.tvacres.com/music_songs_jetsons.htm the phrase "eep opp ork" means "meet me tonight". When did Morris sing that song--before or after the 1962 airing of the Jetsons episode in which "eep opp ork ah ah" was in? Nevermind. Seems Morris did the voice for "Jet Screamer", the character who sung it in the "Jetsons" episode. "The Andy Griffith Show" didn't air until 1964. Now I wonder where the writers on "The Jetsons" got it from...maybe the Road Runner's "meep-meep"? Golden Records released a 45 of the song, sung by Judy with different lyrics. I had the thing when I was 6 or 7; never thought I would have any reason to reference 40 years later. Track that one down, somebody!